It was one of those things that popped suddenly into my heart, that I hadn’t thought about having before, but now wanted with a romantic longing. A leisurely stroll through Mulhall’s Nursery can do things like that to you. The object of my attention: a birdbath. My kids were having fun exploring the statuary garden. They didn’t need my attention for that minute. I wrestled with the logic of my new found affection. Surely I don’t need that. Wouldn’t it be better to take that money and donate it to some good kingdom cause? I was at Mulhall’s after all, this wasn’t going to be a spare change purchase. And I didn’t want just any birdbath. I wanted the one that is now sitting in my flower garden, compliments of my husband’s heart to bless me as I turned a birthday that ended in 5. The romance goes way back. My parents have had a birdbath in their yard ever since I was a small child, and fine feathered friends play merrily in it to this day. Yes, I know all about the green grunge that grows on the bottom of them, because I used to scrub it out as one of my chores. My parents and I would call through the house to each other to come see this or that bird, and take delight in the Lord’s creation. Like them, I love gardening and find joy in simple things like visits from birds. Although at this point in my life, I spend too much time making meals and snacks for my children to put out food for the squirrels. I believe what was calling to my heart was Sabbath Rest. I want to sit out on my deck with my husband and children and watch the birds take joy in our garden. I want to take the time to appreciate the flowers blooming and not just get them dead-headed. Somehow a birdbath was a memorial stone of the Lord’s invitation for me to be still and know that He is God, that He will be exalted throughout the Earth. After the inaugural filling, my kids and I asked the Holy Spirit to invite all the birds to come and enjoy the water, to let them know that it was a safe place. And He did. In a few hours, we spotted the first to take a drink, a shiny blue-black grackle. He was so pleased by the water, he jumped in and splashed around. And many others have followed. Each seems like a special moment of celebration. Man can chisel out a birdbath, but only the Lord can make a bird to revel in it. This entry was posted in Kris' Heart and tagged birdbath, birthday, present, sabbath. Bookmark the permalink. 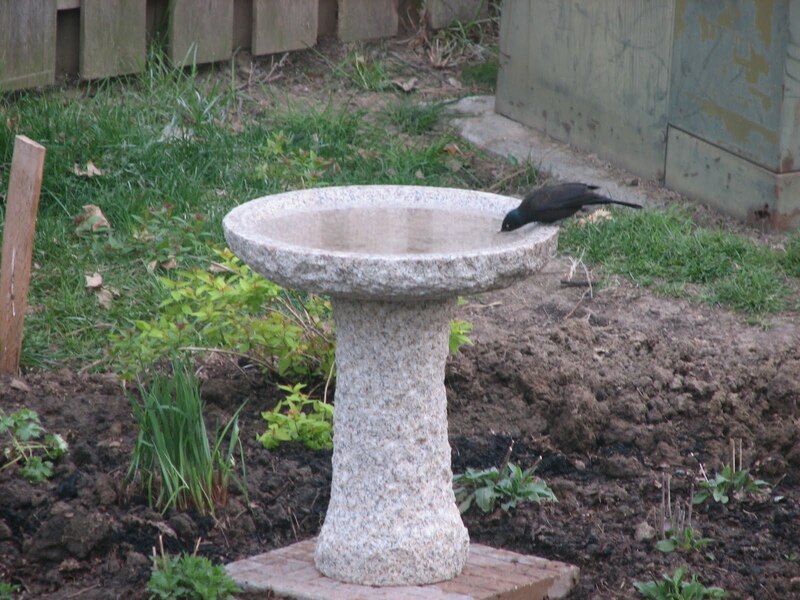 April 21st -Thats a great bird-bath. I see that those that come who are thirsty have a fountain built on rock instead of sand.Currently in the midst of a blizzard in Central Oregon – be glad you aren't here.